Most business owners and executives understand the powerful impact a coordinated, well-designed digital marketing initiative can have on their company’s profitability. And yet, for many owners the idea of spending a significant amount of money on digital marketing can seem very similar to playing a financial version of Battleship: sure, you know there’s an advantage if you can hit the mark, but where should you aim? And with how many resources? Fortunately, with a little effort, self-reflection, and careful planning, your digital marketing can yield a high ROI. So, what do you need to know? First of all, it’s good to be aware that the emphasis on digital marketing will only continue to trend upwards; and any businesses who buck the trend will get left in the dust. As of 2017, SMBs spent an average of 46% of their total marketing budget on digital channels. That means that some companies spent close to 10% of their total revenue on digital marketing. Why would companies invest such significant amounts in the digital world? Simply put, because it works. For example, a restaurant decided to test the ROI on its digital marketing by focusing on one social media channel for one specific day each week, over a period of three weeks. The owner quickly discovered that an Instagram Stories strategy produced lineups out the door! That story also contains a powerful lesson in setting goals. In order to effectively measure your ROI on digital marketing, you first have to understand what your goals actually are. In the case of the restaurant, the goal was to increase foot traffic to a certain location. For other businesses it may be increasing website traffic, boosting customer satisfaction scores, or simply selling more product. To sum it up, your ROI can only be measured by the benchmarks you set for yourself, or your company. 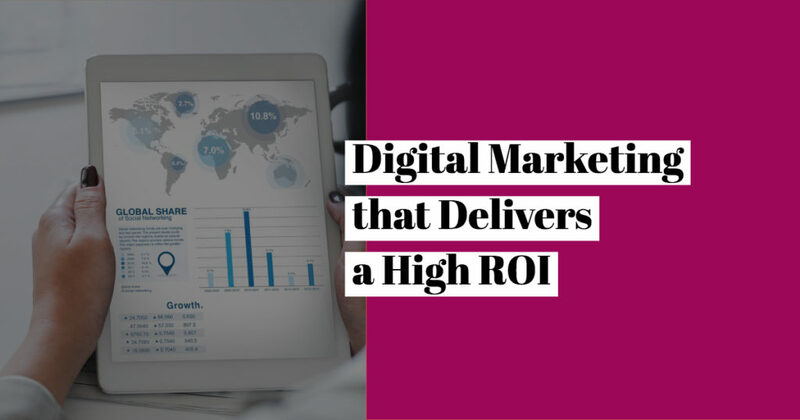 If you set realistic, measurable goals, and think long-term, you may very well find that digital marketing will yield a surprisingly high ROI. If you want to implement an effective digital marketing strategy, or increase your ROI on current initiatives, working with a professional agency can be a huge boost. At Brady Mills, we have years of professional experience with web design, development, and digital marketing. Reach out to us today for more information on how we can help you grow your business. And be sure to check out our tips for effective pay-per-click and social media marketing. Privacy Disclaimer: We will never sell your information to any third parties. Copyright ©2019 Brady Mills LLC. All Rights Reserved.